They walked on, the woman leading, the man trudging after, his steps shortened by his fetters. Around them, the vast, lifeless plain stretched out, littered with detritus that might have fallen from the sky: smashed houses jutting out of the earth at impossible angles; splintering carts; broken tables and chairs; jagged wheels embedded in the ground, their spokes sticking up like fangs; ruined child’s toys; crumbling walls and sections of towers. The plain was speckled with these things as the sky above them was speckled with stars. From time to time, they passed flickering, transparent human shapes—thin, hollow-eyed, dressed in rags—hovering over the wreckage. These shades stretched out beseeching arms, calling soundlessly; the man and the woman ignored these mute pleas and walked on. The man’s eyes were cast down, but not in humility. He was thinking. At length, he looked up. “It is hardly necessary, you know,” the man continued, in that soft, almost gentle voice. “Nor are these—powerless as I am now.” He worked his shoulders, indicating the chains. The smile faded under the woman’s wordless stare. He averted his eyes in a show of submission that failed to cloak seething anger. At last they came to a toppled section of a stone tower, lying on its side like a giant, downed tree trunk. A flash of recognition crossed Edan’s features. Holding the lead in her hands, the woman turned and commanded, “Down.” His knees folded under him like a puppet whose strings had been cut. More anger flashed in those colorless eyes. The woman fixed the lead to an iron ring in the side of the wall. “We will stop here,” she said. Terathena turned that flat brown stare on him. “No one returns from the Desolation,” she repeated stonily. His brows drew together; and then his fury broke. “You can’t!” he raged, helpless. “You can’t abandon me here—I am Edan, the Lord of the Nine, Starkiller, Highest of All! How dare you! You’re no more than a—a tavern dancing girl from a long line of dancing girls, and you think that the few tricks you know allow you to stand equal to those who have spent a lifetime studying the names of the stars! I—I command you!” he shouted. “I command you to bring me back with you, you hear? I—” He ran himself into the ground and knelt there, panting in fear and despair. Terathena simply regarded him, arms folded, displaying no visible emotion. Without a word, she leapt lightly onto a fallen block, then lowered herself to a crosslegged position with her back to Edan. Edan stared at her. Dawning awareness lit in his eyes. Edan began to laugh, a strange, carefree, almost joyful sound completely at odds with the chill that hung about him. Edan went still. He followed the direction she indicated, and paled further. Some distance from them, a bright mass of light flickered into being, moving toward them, slowly and surely; then it broke apart, into a host of human forms. There were thousands of these forms, if not tens of thousands. Men, women and children, reduced to transparent, colorless images that flashed against the night sky. They drifted toward the segment of tower where Terathena and Edan waited, passing through the shattered relics littering the flat plain, past the shades orbiting the relics. Edan steeled himself. “What will they do to me?” His voice was iron-hard. Then Terathena leapt down from the block, yanking the sword from her back. The golden blade lit with eldritch blue flames. She passed close enough to Edan’s head to make him flinch back; as she landed, she lunged into an attack. Blue fire lanced from the blade, striking perhaps a score of the Dead; they boiled away like mist. More pressed forward, but Terathena danced among the shades as a thresher among wheat, slashing with sword and fist. Azure light burst and sparkled with each blow, as more and more of the shades evanesced into nothingness. Yet the Dead paid the dancer no heed; all their attention was on Edan. They struggled toward him, but none could penetrate the circle defined by Terathena’s flaming blade. Cautiously, Edan straightened, watching with bright interest. On and on Terathena fought, showing no sign of exhaustion, and the great host of the Dead diminished. Finally, the very last of them winked out; she lowered her weapon and was still under the dark, starlit sky. Edan followed Terathena’s gaze, and tensed again. Two more shining figures were drifting toward their fallen tower like dandelion seeds caught by the wind. “Will they harm you?” he asked as they drew closer. As they drew nearer, Edan saw that they were both female, Terathena’s age. Colors were muted in the flickering wash of their bodies, but one seemed as pale as he, with large, blue eyes and long blonde hair caught up at the top of her head; the other was dark as burning rock, with a complex hairstyle of tiny braids gathered at the back of her head and studded with pearls and other precious stones. Their clothing marked them as Deep Dancers like Terathena: the midriff-baring top, the loose breeches gathered into low, soft-fitting boots, the coin scarf at the hips. They too had swords at their backs; but the dark one carried a veil wound about herself, while the blonde one was laden with rings, bracelets, and necklaces. They stopped perhaps half a dozen paces away, gazing at her. Terathena looked down at him. Again, when she spoke, there was an air of resignation and acceptance; if this was a punishment for her, then answering Edan’s questions was clearly part of it. “They are my line-sisters and members of my trio. Teraisë and Teramin.” She nodded to the pale one and the dark one in turn. “I see.” Edan cast his eyes down, thinking. “They must be very angry with you, to come to you so,” he said, his voice laden with false sympathy. “I could say the same,” murmured Edan, a small smile playing around his lips. In the sky, a dark cloud was gathering. Edan followed the line of Terathena’s pointing blade and saw it: a thick, dark, roiling mass. It looked something like a thunderhead, far off, yet swiftly drawing nearer. A sound drifted to them: a high-pitched, whining noise that seemed to drill into Edan’s brain like a diamond-tipped blade. He knotted his hands into fists behind him and looked up at Terathena, to see if it was grinding on her too; her face was as stony as ever, but there was a new tightness around her eyes. The cloud boiled closer still. It seemed to be made up of fine particles of some sort, but he couldn’t tell what—and then it struck him. Thousands, perhaps millions of tiny insects, milled above them in the starry, empty sky. The cloud wafted over them—then bent and twisted back upon itself, and arrowed straight for them. “Thena!” he shouted in warning. But Terathena was already moving, tracing a circle around them, her feet weaving an intricate pattern of steps. She swirled and tossed her sword so that it flashed in the air, a flowing snake of blue-gleaming metal. Where she stepped, a shield of blue flame blazed alight, arching over them in a perfect dome. With the shield complete, she raised her sword to a guard position and set herself. The insects came for them, squealing mercilessly. They were hideous, bristled creatures: each as long as a thumb, black bodies banded in sickly gray or blue or green and ending in inch-long, gleaming stingers. Their tiny heads were a twisted parody of human features; they called in voices rendered shrill and tinny by their size, and it was this that made the sickening whine. They were so repulsive that Edan drew back, shaking; then the creatures in the leading edge of the attack struck the barrier and flashed into flame. They blazed out as quickly as sparks, and the entire cloud halted. It lifted away from the barrier, milling in buzzing confusion. “They are so ugly,” he mused. “They carry vile deeds.” Terathena tightened her hand on her sword hilt. Edan lowered his eyes in thought. “And how many of these insects have come for you, Terathena?” he asked her, with that same false sympathy. She did not give him so much as a glance. But she lifted her free hand and held up fingers—one, two. Teraisë and Teramin. He laughed again, while above, the cloud came for them. The full mass of insects struck the shield with a roar, like waves crashing on rocks. Hundreds of them went up almost instantly; Edan squinted against the brightness of the little creatures’ funeral pyres. Another wave came at once, and another—until under the onslaught, Terathena’s defenses began to weaken. The blue fire of her shield bowed inward, growing thin. In the shadow of the surging insect cloud, he shuddered. “We can only hope.” Terathena swept her sword along the places where the shield was injured. More blue flame followed the curving path of her blade, but for every damaged section she healed, another appeared. Edan watched, fascinated. He had always dismissed the Deep Dancers as tavern wenches; he had not dreamed they had such power. “If you free me, I can help you, Thena,” he offered. “Be silent,” she snapped. She danced within the shield, faster and faster, and yet more and more of the insects flung themselves against her defense, until a section of the barrier was worn paper-thin. “I see it!” She whirled to face the new vulnerability. Yet as she threw her fire at it, more rents began to open up in the fabric of the barrier. A huge section of the dome split open from top to bottom. With a cry, Terathena extended herself in a wild lunge, sweeping the blade down the gaping rend as if opening an opponent’s belly. The wall of the barrier flowed back together, but a high-pitched whine announced that some of the insects had slipped through. Edan felt three searing pains at the base of his neck. With a choked cry, he collapsed flat on his face, pressing his forehead against the hard earth. His guts were filled with lead, his heart with ice. Guilt! It seemed like a lifetime before the three points of heat were swept from the base of his neck. The burden lifted; even so, Edan kept his face pressed to the ground, lacking the strength to move. The after-effects of that horrible guilt were still with him; he trembled, terrified that it would return. He lay there, helpless, hearing Terathena’s blade sing as she danced, defending him. Finally, as the last edge of the insects’ hum died to silence, Edan raised his head. Terathena stood with her back to him, her sword clutched in one hand. Her back was straight, her head high; her countenance was grim, rocklike. The blue, flickering shield was gone. Around them, a perfect circle was demarcated by ash and insect corpses piled in tiny mountains. Outside the circle, Terathena’s Dead remained, watching her with deep sadness. Something in the set of Terathena’s hard shoulders showed that she was acutely aware of their presence. Edan looked closer. Clinging to the back of Terathena’s neck were two of the same, wasp-like creatures that had stung him. Absently, Terathena reached up and slapped the wasps away. “Did you know?” Edan asked, his curiosity getting the better of him. Edan’s voice died in his throat. He almost choked from the force of it, from his own rage and anger. Terathena resumed her position, staring out across the plain of wreckage and shades, simply watching. Suddenly the realization struck him that he could not remember the others. Even their faces were misty. Had there been the full eighteen councillors? He tried to recall the details—but they slipped away. With a bright spark of fear, he reached further back, for that last, disastrous battle where his forces had been overthrown and he had been enchained. He could remember staring out over the walls of his citadel, built in the ruins of the City of Starlight, seeing the forces arrayed against him across the Plain of Stars; could remember his fury at their defiance, at his own subordinates’ failures, but little beyond that. He knew that the walls had been breached, that it had come to hand-to-hand fighting within the citadel itself…but the memories themselves were gone. He could only remember three things with clarity: the faces of his Dead. Burn the Triune, he thought viciously. Above him Terathena watched the skies. Silence stretched out; minutes turned into hours. The faces of his dead filled his thoughts. Edan slowly realized he felt a chill…as if strength was draining from his bones. A strange lassitude seemed to be creeping into his body. He started up with a gasp. “Yes.” Terathena nodded. “I feel it as well.” Her rigid, upright stance was starting to falter. “It is the Desolation. It drains you of your strength, your life, until there is nothing left, and you become…” She nodded toward a pair of shades sitting on a shattered oven: a sobbing outline of a man holding a child. “You have no choice. Neither do I.” She returned to watching the wastes. Edan gritted his teeth, angry not just at her response, but at his own weakness. I will not speak to her again, he vowed silently. More time passed; there was nothing but that gnawing, cold lassitude. Terathena’s sword sagged, as if it were too heavy for her to lift. Edan found himself shivering as if he were standing in a blizzard. Yet the cold did not seem to be physical. There was nothing to do but to contemplate the end. At last Terathena took a seat on a stone block that had fallen from the tower. It was the ruined Tower of Stars, his citadel; he had recognized it at once. Seeing the ruins here had shaken him; it seemed almost purposeful. If Terathena recognized it as well, she showed no sign; she settled with her back to the wall, resting her sword on the ground. Her eyes were distant. Her Dead moved to stand beside her, each still watching her with identical expressions of deep grief. Seeing them grated on Edan’s nerves. He saw a brief blankness in her eyes, as if she were struggling to remember, too. “I can’t,” she said at last, and looked down. It took Edan a moment to realize what was in her voice: Helplessness. The thought flickered that he could use this to his advantage, but it was distant. He realized, with dismay, that he was coming to accept that no escape was possible. “Why not?” They bothered him, those Dead of hers; their silence, their piercing gaze. Edan said nothing, but that small smile remained. “If they were content, it was because you had stripped their minds away and turned them into empty vessels for your will, Edan Starkiller,” she retorted. Edan fell silent, seething. Terathena continued. “Elean, the City of Dreams, is not the City of Blades—Elean rules by wealth and splendor, not by iron and steel. They had few defenders to send against you. I and my sisters—” She looked over at Teraisë and Teramin, and Edan gritted his teeth at the emotion in her eyes. I did not take them from her; she did that herself, by her own admission. Under Terathena’s gaze, his smile withered. She went on. “Those who argued for peace pointed to the City of Night. There had been a few brief reports conveying that they had been treated well after your conquest. But my sisters and I—no. I did not trust them.” She lifted her eyes to her sisters again. The sorrow in their faces deepened immeasurably. “I suggested that we should go to the City of Night ourselves, to learn whether my worst imaginings were true. They…they agreed. We had pledged our lives to each other: that we would face all dangers together, that where one of us went, so too would the others. We had pledged…” She trailed off. She brushed at her forehead again. “I watched as they approached the city gates; as they were surprised, overpowered, and taken to the holding pens. I watched, from the heights of the hillside, as they were thrown into the great forging vats in the heart of the city; as they were remade into mindless, obedient thralls. When the transformation was complete and they were sent out to walk the roads, I confronted them and slew what was left so that they would not suffer the fate to which I had abandoned them. The fate that, by right, I should have shared with them. The two shades shared a glance, joining hands. A deep and aching grief was in their faces. Edan lowered his eyes once again, thinking. The fatigue drained him, clouding his mind. He was beginning to find it hard to breathe, and more and more memories were fading. Her sisters…Teraisë, Teramin… He thought he could see the shadows of his Dead behind them. Everything else was faint. Edan thought at first to dismiss her question, but then paused, considering. What else was there to do in this place? “Perhaps you are right,” he admitted at last. “To me they were just…means to an end.” His thoughts circled morbidly. “Something to be proud of,” Terathena said coolly. “No one believed her?” Terathena asked. “You did not answer the question, Killer of Stars,” Terathena pressed. The eyes of her Dead rested on him. “And you as well, shades,” he snapped. “Because no one would follow me any other way!” he burst out. He dropped his eyes and stared at the ground, working his hands behind him; a slight flush stained his chalky complexion, though Terathena, watching, could not tell if it was shame or rage. Perhaps both. “How should I know,” Edan said, scowling. “Why does anyone follow anyone? Why did your Dead follow you? It was enough that he did.” He jerked irritably at the manacles. Terathena was silent, but her eyes rested upon her sisters. Edan felt sudden irritation prick him. “Then you are a fool,” he said. She was still watching her Dead. It grated on him. “You think I should seek forgiveness,” he said sharply, wanting her to look at him, the living. “Then why don’t you seek it from them?” And he nodded to her Dead. Edan shrugged. He was tired of talking anyway. He wondered briefly if Demeald had been in the horde of Dead that Terathena had slain to preserve him. “So, this is it?” he asked sometime later. “The two of us just sit here until we fade?” His voice was thin, weak. “If…we are fortunate,” Terathena replied. Suddenly, a strange alertness came over her. Her eyes fixed on the distance. “Ah,” she said, reaching out to touch the sword that she could no longer lift. A faint smile flitted across her lips. And she nodded toward the horizon. Edan looked toward the line where the star-studded sky met the blasted earth. There was a strange thickness, as if he were seeing a distant object. As he watched, the horizon line strengthened. The thickness became an indistinct shape, drawing nearer. Edan felt a chill. “What is it?” he asked Terathena. Edan could see it now: a great dense fog drifting toward them. It looked like an elongated cone of swirling smoke, with a tail that lashed from side to side. As it came in contact with the pale, wailing shapes clinging to bits of debris, both shapes and wreckage winked out of existence. It is consuming them, he realized with a start. Its head swung toward them: there were no eyes, no nostrils, no features of any kind, only a giant circular maw lined with row upon row of teeth. Even at this distance, a tremendous roaring sound came to his ears—the sound of its feeding. “What is that monstrosity?” he demanded. Even as she spoke, the creature again swung in their direction. Its gullet was all the shades of red in the world against its dull smoky exterior. Its tail lashed over a ruined forge as it began to drill toward them. Triune, it must be huge. Edan’s spine chilled. Despite the distance, he estimated that he could stand inside the creature’s throat, stretch his arms up above his head, and there would still be room to spare. She pulled her weapon forward laboriously, then levered herself up. She almost fell more than once. Finally, leaning on the Tower wall, she reached her feet. It was painful to see her thus, and Edan looked away, working his hands in the manacles. Her Dead watched mournfully. She regarded him skeptically. Her Dead folded their arms and glanced at each other with that same disbelief. They watched the Devourer’s approach without emotion; perhaps it held no fear for those already dead. She looked from him to the Devourer, her expression flat. The ground was beginning to tremble now. “It would be foolishness for us both to die in that creature’s gullet,” he told her, softly serious. “Yes. Suicide.” Her eyes remained fixed on the creature; at once, Edan understood, and felt anger. Her dark eyes narrowed. The Devourer drew nearer, the ground shaking, its roar filling the air. It inhaled a huge dragon skull, then the top of an ornate carriage; the elderly man in senatorial robes who had sheltered beneath it went to his doom without complaint. At last, Terathena released her sword and dropped to one knee behind him. Edan felt the manacles and fetters fall away. She touched the strand of light that chained him to the tower wall, speaking a word, and the collar lifted from his throat. Edan shook his wrists to restore the blood flow, then sought to rise, almost overbalancing; he had underestimated his weakness. He faced Terathena, meeting her steady gaze. The Devourer roared like a terrible gale. Wind screamed in his ears. She studied him. Then, as if this too were something she must endure, she turned to face her sorrowful Dead. “Well done, Terathena,” Edan said quietly. She seemed not to hear him, focused entirely on her silent, watching Dead. Edan dismissed her, and turned to face the Devourer. It was almost upon them. Its fog-like tail lashed. Its maw loomed up above him, twice, three times his height; its throat seemed paved in fire. Long, gleaming ivory teeth studded its gullet in concentric rings, all the way down its throat. The ground shook so hard Edan could barely stand, and a great blast of scorching-hot wind made him stumble The creature’s roaring filled his world. Still, he felt strangely light hearted; he had chosen and by the Triune, he had no fear of the end. One last time he thought, without rancor, of his Dead—Narelan, Selchie, Demeald—and then all that was left was a heady sense of freedom. Edan laughed again, a bright, carefree laugh. Terathena saw him spread his arms wide, and he began to call upon the Nine Names of the Stars, the words that had given him his strength in the world outside. The fog skin of the creature began to split. Fissures appeared, running the length of its body; smoke trailed from them, streaming into the air like blood in water. Its tail thrashed; it writhed in evident agony, and the roar of its breath grew high, keening. Edan was reeling too. With each Name, he paled a little further, swayed a little more. By the time he spoke the Third, he almost fell; with the Sixth, he collapsed to his knees, and tried to rise but failed. His lips moved, but Terathena could hear nothing above the din. He was trembling in every limb. As he knelt there, panting, the Devourer reared up into the sky and then plunged downward. Its howls sounded like the shredding of the world. Edan lifted his head and spoke one final word. 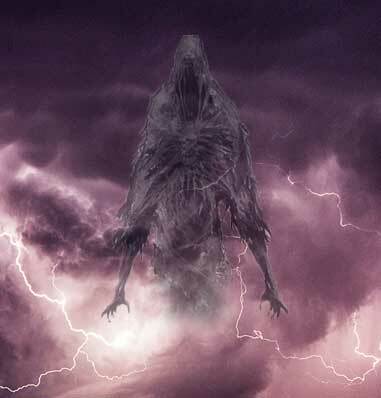 The Devourer began to shatter, streaming smoke so thick that Terathena’s eyes stung with it; and Edan gazed straight at his doom as with its dying breath, the Devourer swallowed him whole. Then, the fog creature crashed to the ground, shuddered, and was still. Terathena approached the carcass of the dead beast. It lay like a beached whale, stretching on forever. Smoke still streamed like blood from the cracks in its surface, though it was thinning to a trickle. She reached out and laid one hand on its side; fog pooled around her fingertips. “Well done, Starkiller,” she murmured. “Terathena,” a voice came from behind her. She turned, one hand going to the hilt of her dance sword, though she was so weak she could barely lift it. Teraisë and Teramin stood hand in hand, shining so brightly that Terathena could scarcely look at them. Their terrible grief was gone as if it had never been. Instead, a radiant joy filled their faces, shining straight into Terathena’s heart. “My sisters…” The tears in her eyes were not from smoke. “Our sister.” Their combined voices chimed like the ringing of bells. Almost blinded by emotion, Terathena reached out to them—but then realized with a shock that they were disintegrating before her eyes. “Teraisë—Teramin—wait!” She longed to take them by the hands, to hold them with her just one moment longer. The world was fading; her line-sisters were no more than featureless outlines of light. Yet still she could see their eyes, shining with love and joy. And then Terathena knew that the grief in their eyes had never been for themselves, but for her. A light breeze was playing across her face. She was lying on something soft that felt like grass. She opened her eyes, and sat up. Terathena found herself in a grove of trees. Oak, sycamore, rowan, hazel, maple, ash, walnut, mulberry, cypress: the trees of the nine cities. It came to her that she was in the Forest of the Nine, the grove where she and Edan had been transmuted to the Desolation. The trees’ branches formed a solid wall of green leaves around her. She looked up at the sky. It was night. The Stars blazed forth in the heavens. The light breeze brushed her cheeks and stirred her long curls. Beside her, on the grass, lay Edan’s lifeless body. Starkiller—who wrought so much devastation in life—looked almost peaceful in death. She looked up at the sky again. She was here. She was here. Slowly, she rose to her feet, stretching her arms up to the heavens, giving thanks to the Triune Mother that she had returned. Survived. She then looked down at the dead man and nodded to him as well. Thank you, Starkiller, for your final request of me. Had he wanted her to have the release he could not have sought for himself? Her thoughts turned toward Teraisë and Teramin. She reached back, touching the hilt of her dance sword, then straightened her shoulders. In one smooth movement, she drew her weapon, then held it out, pointing it straight at the tree limbs forming the barrier. They uncurled from each other to create an archway. Beyond was a long, grass-covered hill, sloping down to a rippling river. Low, forested mountains loomed beyond, dark shapes against the brilliant stars. Terathena felt buoyant, as if a weight had been lifted. She drew a breath and then stepped through the arch in the foliage. The night lay before her, open and welcoming. The leafy archway closed again behind her, hiding Edan’s lifeless form from view. She sheathed her weapon and started down the grassy hill, toward the world that waited for her.